This gig wasn’t well attended. Grand Slam were a shadow of Thin Lizzy, and sadly Phil Lynott didn’t look well. His face was bloated and his performance lack lustre. The concert was a disappointing, sad affair, particularly in comparison to the power and glory days of Lizzy. They played a few Thin Lizzy songs, I think “Whiskey in the Jar”, “Sarah” and “Cold Sweat” from “Thunder and Lightning”. They also performed Phil’s great solo track “Yellow Pearl” (written with Midge Ure and the theme to Top of the Pops in the early ’80s) and “”Parisienne Walkways”, which Phil wrote with Gary Moore. A live CD suggests that they may also have played covers of “Whiter Shade of Pale” and “Like a Rolling Stone”, but I don’t recall. 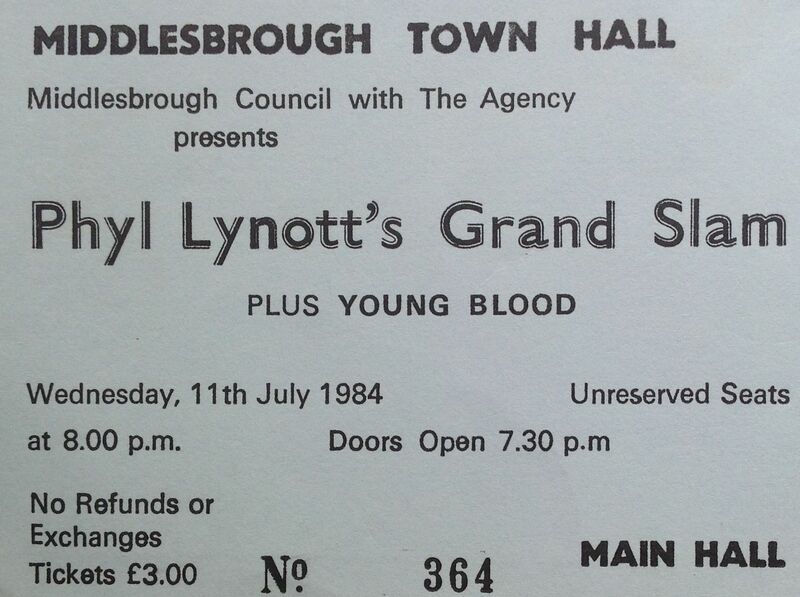 Support came from Young Blood a NWOBHM band from Darlington. Grand Slam’s line-up was Lynott (bass, vocals), Laurence Archer (lead guitar; ex-Stampede, Wild Horses, Lautrec), Donal ‘Doish’ Nagle (guitar; ex-The Bogey Boys),[ Robbie Brennan (drums), and Mark Stanway (keyboards; ex-Magnum). I prefer to remember Phil as the wild rover, the cowboy, the vagabond, the Rocker, “one of the boys” that he wrote and sung about, and to think about the many magnificent Thin Lizzy performances I saw in the north east and at the Reading festival. Phil Lynott died on 4th January 1986 (aged just 36) from heart failure and pneumonia. He had been admitted to hospital on Christmas Day, after collapsing from a drink and drug binge at his home in Surrey. Another sad note. Yesterday we lost another great musician, bass player and singer, Jack Bruce. I am a big fan of Jack Bruce’s music. His passing is really sad and makes me realise that we are coming to a stage where we are losing more and more of the legends who formed rock as we know it.